So why don’t other people give me the respect I deserve?” The problem could well be due to difficulty with assertion. Maybe you aren’t showing your nice, polite, and respectful qualities to other people. Unless they can see who you truly are, underneath it all, other people might not know how you expect to be treated. And this can lead to some unhappy experiences. We see instances of nonassertive behavior around us everyday. Most people who lack an assertive style are simply those who want to keep the peace. For the most part, they want goodness and cooperation between people. However, they often pay a high price for this in terms of functioning effectively in the world. There are negative consequences associated with the nonassertive style. For example, those who are not assertive allow their feelings and boundaries to be violated by others. They believe that they do not have the right to their own feelings, beliefs or opinions – and even if they do, they have difficulty in expressing them in a self-affirming way. 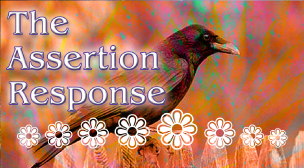 They may feel that asserting their thoughts will lead to rejection or even being attacked. They frequently feel that it is better to withhold their ideas rather than cause a conflict. Nonassertive people may feel guilty when they have to say “no.” They allow others to make decisions for them and may assume that others will care for their needs. They may place the needs of others above their own. Nonassertive people are victimized by others. The consequences for choosing to be nonassertive are costly. People feel hurt and mistreated when their needs are not met – yet those who are nonassertive do little to meet these needs themselves. They may store up negative feelings and then harbor anger. Their sense of efficacy in the world is diminished, and then they complain about how unfair the world is to them. This approach toward the world may lead to depression, poor self-esteem, anxiety, isolation, and anger. There are better alternatives. Self-Esteem: How you define yourself, positively or negatively, depends on the messages you’ve heard from others throughout your life. We internalize the things we’ve heard about ourselves from other people, and this becomes the basis of our self-esteem, which can be either mostly positive or mostly negative. If we see ourselves in a negative light, we may feel that we are not worthy of speaking up for what we want – and this can lead to nonassertion as a lifestyle. People who work on their assertiveness skills have to look deeply within to assess their self-esteem and see what they can do to create a more positive definition of themselves. They can find things about themselves that they like. They might practice saying affirmations to themselves (affirmations are sayings such as “I like myself more and more each day”) until they become a reality and replace the old negative messages they may have heard throughout their lives. They may have conversations with people in which they talk about their positive qualities and maintain a positive tone throughout the conversation. Turning an old legacy of negativity into a present sense of positive feelings takes some work, persistence, and motivation, but the rewards are enormous. One day you realize that you really do like yourself, you like who you are, and you are willing to let the world know this. (This does not imply that you are working toward conceit or a superior, condescending attitude – you are simply working to repair old negative messages that have held you back in the past. You are working toward balance.) Assertion requires positive self-esteem. Once you feel good about yourself, you can then go out into the world with a healthy sense of pride and assertively deal with the many experiences and people who come your way. Communication patterns: Good communication requires the ability to listen to others and to express your thoughts and feelings while you maintain respect for other people. It involves the ability to express your ideas clearly and effectively. Assertion does not involve blaming the other person or putting them down. There is no room for sarcasm when communicating assertively. Assertive speaking often involves the use of “I” statements – that is, you talk about how you feel about something without attacking the other person (for example, you might say, “I feel uncomfortable when you talk about Mary that way,” but you would not say, “You make me feel uncomfortable when you gossip about Mary”). Assertiveness does not aim to put the other person into a defensive stance, but rather opens communication patterns between people. When speaking assertively, your voice is well modulated and warm and produced at normal volume. Your flow of words is even and conversational. Your voice is relaxed – for example, you might say, “This steak is well done and I asked for medium rare,” in the same tone that you might use to comment on how blue the sky seems today. And, of course, your nonverbal cues should be consistent with your verbal communication. For example, the statement, “I’m not angry,” would not be uttered through gritted teeth and flared nostrils. Relaxation: Many nonassertive people complain that they fall apart emotionally when they get into confrontations or other stressful situations. They feel as if their emotions are out of control – tense posture, no eye contact, quavering voice, disjointed thoughts. It is helpful to realize that stress in social encounters is a learned response. You learn to be tense in certain situations. Similarly, you can learn, through practice, to be relaxed in these situations so that your predominant response becomes relaxation rather than stress. There are several techniques for learning to relax, such as deep breathing, meditation, deep muscle relaxation, and desensitization. Many therapists are able to teach these simple, but effective, methods as part of psychotherapy. Authenticity: Learning to become assertive is not just an exercise in discovering appropriate responses to uncomfortable social situations. Rather, it mirrors a personal process of self-discovery that is often aided by working with a therapist. The goal is to reach your authentic self, your integrity, or your genuine core. This process involves examining your life objectively, understanding what the various forces and experiences are that made you who you are today. It involves self-acceptance. It may involve forgiving those who have been unfair to you – or not. At some point in the process of self-discovery, you acknowledge the imperfections within yourself and other people, and you accept them. You begin to know who you are and what you like and dislike. And, in a comfortable and undemanding way, you want to share all of this with the world. When you can comfortably share your authentic self with the world around you, with integrity and respect for the rights and wholeness of other people, you are truly asserting yourself. Recognize that people are responsible for their own behavior. It is not helpful to blame other people when they choose not to do things that you need or want. You can assertively tell another person what you feel about a situation, but then it is the other person’s choice to go along with what you want – or not. This is your way of showing others that you respect them, and they, in turn, will probably show you respect as well – or not, but then we accept the consequences. Let other people know exactly what you want without making vague requests. State your full position when conveying your wishes to others. Other people are not mind-readers, even if you are close to them. It may seem easier sometimes to drop a hint and hope the other person guesses what you want, but this leads to confusion and unmet expectations. If you are specific and clear in your communication, others don’t have to play a guessing game and they will know exactly how you feel about a situation. And this allows them to make an appropriate response. Take time out if you need to contain your anger. Sometimes we find ourselves getting angry during a conversation. Rather than undermining our true goal of bringing about a constructive resolution to our differences with other people, it may be more helpful to take some time out to collect our thoughts so that our position can be presented more effectively. This is not the same as cutting off another person emotionally, which is a destructive tactic. Think through your arguments before presenting them. We sometimes get so lost in the trivial details that we forget the main points of our arguments. Think through the issues and get down to the core points that you want to make. You want to present your argument clearly so that the other person has a chance of understanding it. The other person will be much more willing to listen if your ideas are presented in an organized and consistent manner. Recognize that people are different and are entitled to their own point of view. Open yourself up to hearing what the other person has to say. This does not mean that you necessarily have to agree with an alternative viewpoint, but it is helpful to realize that two different positions can exist at the same time. 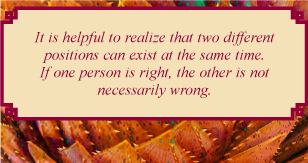 If one person is right, the other is not necessarily wrong. All of us have had the experience of being insulted, and it is most uncomfortable. An insult can easily mess up your day, if not your week. Insulting another person is a form of aggression (unless, of course, it can clearly be defined as banter between trusted friends). When you are insulted, you may silently punish yourself for leaving yourself open to the put-down. Or you may even agree with the insult as if it had validity (“Yes, I should take the tape off these glasses”). Some of us simply cringe occasionally when we remember the put-down and think of it as one of our bad memories. A few lucky people seem to be able to let it go and move on. Admit when you have done something wrong if you receive an insult, even if it is accidental. Now it’s time to be assertive. In a calm voice and with good eye contact, say, “I would appreciate it, however, if you would not call me names in front of other people or shout at me, even if you are upset. I can understand your point without that kind of behavior.” And then bring the encounter to an end. Sometimes insults are nonverbal. This can be seen with the rolling of the eyes, the silent chuckle as you are talking, pouting, obscene gestures, staring off into space, sighing. This type of insult is more difficult to handle because it is easily denied or it could simply be a mannerism of the other person. The aim in this case is to bring the nonverbal communication into the verbal realm. “Did I say something to offend you?” “I am having difficulty understanding your gesture. Could you please explain what you mean?” It is fair to you to get feedback if you have indeed said or done something to offend the other person. But now the confrontation is in the verbal realm, and the assertive responses appropriate to verbal insults can be applied.